I’ve never heard of the Spectra brand until an old high school friend mentioned it. 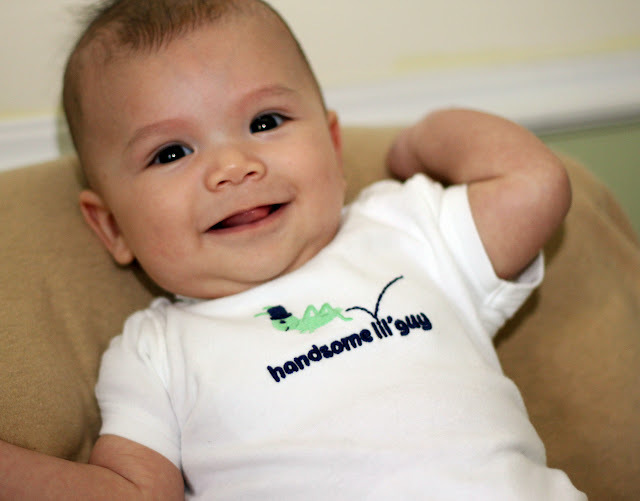 The brand is popular in Asia and Australia, and recently expanded to the North American market with Spectra Baby USA. I was renting the Medela Symphony pump for $75/month, when I looked into the Spectra pumps. I was content with renting a pump, but when I discovered the hospital-grade S1 pump priced reasonably ($319USD), it made more sense for me to buy. There are a few features that are better on the Medela Symphony, but overall, the Spectra S1 pros outweigh the cons, and I am so happy with my decision. So how has the S1 saved my sanity? Instead of spending almost 2 hours of my day “chained” to one spot, I’m able to carry the pump to walk around (with my makeshift hands-free pumping bra aka bandeau with cutouts) and do other things. Plus, the built-in timer means there’s no need to watch the clock anymore. And the best part…my output increased! I’m not sure if it’s because I’m less stressed or if this pump is actually more efficient; regardless, I no longer dread my pumping sessions. Edit: After a few weeks, I modified my setup so I was able to use the Spectra pump with Medela parts. The Medela collection bottles were just better for me. To do this, I cut the end (part that connects to the pump) of the Medela tubes and attached that directly to the Spectra pump. Note: This does change the system from being a closed one to open (like Medela), since there won’t be a barrier between the milk collection kit and the pump, so you would need to make sure that no moisture gets into the tubing. But how do you know if you’re doing them right? Thanks to smartphones and wearable technology, these can be tracked! Crazy, right? kGoal is an “exercise tool” that you insert and communicates (wirelessly, thankfully) to your smartphone to give you real-time feedback. What will they come up with next?? 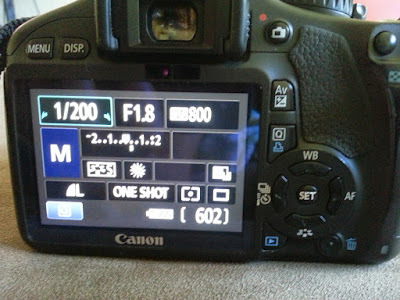 I’ve had my Canon T2i DSLR camera for a few years now, and I’ve never got around to learning how to use it properly. Every time I start learning about it, I get overwhelmed with all the variables and I would just go out and experiment. It required too much of a commitment to understand and remember the science behind taking a good photo. Without really knowing how to set up the camera, no wonder why it would take me dozens of shots to get a decent one; and I still relied on my Photoshop skills to make it a “good” photo. Shutter speed (1/200 in photo) – Adjust this according to your lens. Add at least “100” to your lens focal length. I have a 50mm lens, so my shutter speed should be no less than 1/150 (or 1/160 as per the camera setting). For example, I would start at 1/160 and go up from there (1/200, 1/250, etc.) depending on my subject. Aperture (F1.8 in photo) – The lower the number, the blurrier a background will be in a photo. This is what you want if you just want to focus on the subject and “blur out” the background mess. I think the lowest it would go on the Canon kit lens is F5.6. ISO (800 in photo) – The higher the number, the more light you’ll let in the photo. Being indoors, I would start at 800 and play around from there. There you have it. For a beginner like me, these are three settings to play around with in manual mode. You want to get to or as close to “0” on the scale to get the proper lighting. (Hint: On a Canon, press the * button to see the scale results of your current settings.) Have fun and take lots of photos! Oh, and the most important tip I picked up that day: Let others take photos of you and your little one together, regardless of how your hair looks or how you feel about yourself. In 10 or 20 years, you’ll be glad you have that photo of you and your baby — and who knows, you might even think you never looked better! Someone’s Three Months Old Today! I’ve heard many times to “enjoy these days, because the baby grows so fast.” And I can see that it’s so true. Jarvis is no longer a newborn. He’s now a little person I can interact with. The past three months have been so enjoyable. Personality: He loves to smile and laugh. He gets cranky when he’s hungry, tired or needs to burp. He also “converses” a lot. We have a lot conversations that involve him responding to me with coos and grunts. It’s quite entertaining. Recovery: Sometimes I still feel a heavy pelvic pressure like my uterus is falling! I think it’s just weak pelvic floor muscles. Other than that, my recovery has been good and uneventful. Diet: I purchased a bunch of Supperworks meals almost 2 months ago, and that provided some healthy and easy meals for a few weeks. Since then, however, my somewhat healthy diet has deteriorated. Now, it’s just all about quick, easy and tasty food, which means takeout, pasta, milk and cookies, peanut butter and jam sandwiches, etc. Sleep: For the most part, I get two-hour blocks of sleep between 12AM-8AM. Mood: Happy. I do have my moments when I feel exhausted and overwhelmed, but this past month has been really fun. Every time baby giggles or smiles (which is pretty often), my heart melts. Many times, I’m doing a middle-of-the-night diaper change; I’m tired and just want to get it over with and get back to bed. I put the baby down on the change table and he looks up at me with his big gummy smile. I love it. My heart skips a beat every time. I’ve been “wearing the baby” for over a month now, and it has definitely made my days easier. 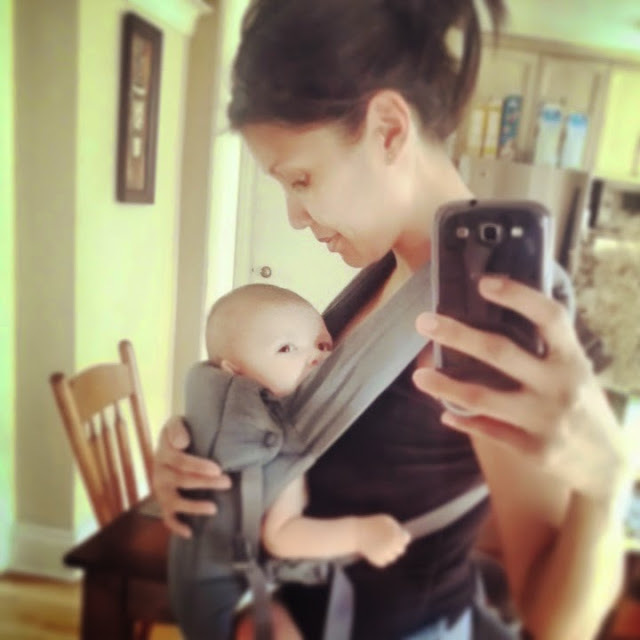 I use it at least 2-3 hours a day, depending on what I need to do and the baby’s mood. And most of the time, baby is so comfortable in it, he falls asleep pretty easily. I even figured out how to nurse in the carrier! It’s brilliant and so convenient.